The flooding last June should prove the importance of the Keweenaw ATV Club to anyone who would question the need for the Club. The morning of the floods, while still raining, Keweenaw ATV Club members were out marking hazards and the many washouts on the trail to prevent injury to unsuspecting riders. Members also rode the entire length of the trail that was damaged by flood waters, photographed the damage, and forwarded it to the DNR so they could start planning their response before coming to the area. A Big Thank You to our members who are always ready and willing to help when needed. The Club helped with reroutes in an effort to keep trails open. We also repaired and up graded the trail on the North side of Calumet to handle the additional traffic caused by the closure of other trails. We were able to expand the upgrade to this area with a generous donation from the Keweenaw Community Foundation and material donated by Mohawk Sand and Gravel. The grading and additional work was done by Kalcich Excavating. We would also like to Thank The Mud Brothers of The North atv/utv Club, for their generous donation, It really helped after the floods. And The Portage Health Foundation, for their support during this time. Thank You. We also repaired seven areas between Calumet and the Mandan Road, that suffered from the excessive rainfall, for a total of about two and a half miles. The DNR was burdened with the major washouts and damage to the communities, so we took over the project to brush and widen the trail from Ripley to Dollar Bay. The Club will continue to work on improvements to this area next season. It was the Keweenaw ATV Club that arranged for the right of way and provided insurance for what is now called the Lake Linden Trail that runs from Hancock to Lake Linden. The Club pushed the DNR and the State of Michigan for eight years until this route became a state owned trail. If this route was not state owned at the time of the flooding, it’s doubtful that funds would be made available to repair the damage and the trail would be lost. Repairs are going to be very time consuming and costly and the DNR is working very hard on getting repairs completed and the trail reopened. The Club also supports the Keweenaw land swap between the land company, TRG, and the State of Michigan. The land swap would result in the State owning the land that our trails are on. Without the protection of being State owned, it’s possible an individual could purchase a parcel that includes a portion of the trail, block access and jeopardize the rest of the trail system. 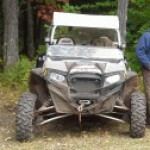 It is then tasked to the Keweenaw ATV Club to try to find a new route. As a Club and riders, we owe many thanks to TRG, American Forest Management, and many individual property owners that have granted permission to cross their land. Without their support, the trail system would not exist. We already have many projects planned for next season including the development of a trail and parking area at Fish Cove in Keweenaw County. As we are working on developing new trails, it takes many members to maintain the existing miles of trails. if we wish to expand the system, the Club needs to expand also. Please encourage other rider to join and support the Keweenaw ATV Club. In the spring we will be printing new ATV Trail Maps for the 2019-2020 seasons. Thank you to all the business owners and ad sponsors on our map that support our Club. In return, please support them. THANK YOU ALL FOR ALL THE SUPPORT YOU SHOW.